"Deal Kent – Welcome to the friendly seaside town." Whether young or old, going out with your friends or family, there is something for everyone in Deal, Kent. Deal has an excellent range of independent shops, 3 weekly markets, 2 castles, wonderful architecture, a pier and 3 small museums all within walking distance. With so much on offer to explore and to visit, why not stay a while? There are many hotels, B&Bs and holiday cottages available. 6th – 8th September 2019. Free admission. Cooking demos, international street foods, artisan grocery plus real ales, ciders, craft lagers, specialist spirits and more. Live entertainment. Click here for more information or to book a stall. The 149th Open is coming to Kent. Royal St George’s in Sandwich near Deal will host the world-famous golf event in July 2020 in what will be a truly exciting time for Sandwich, Deal and Kent in general. For more information and for holiday cottages near the Open Golf click here. Deal is a winner of the Daily Telegraph’s High Street of the Year award. Another article described Deal as ‘Britain’s most beautiful seaside town’. There’s plenty to do for visitors of all ages.The town centre is pedestrianised and most of the town is on the flat making it ideal for disabled visitors. Deal has a quarter mile long pier that gives great views along the historic beachfront. The pier head restaurant is set to reopen on 4th January 2019. It has a timber and glass construction with fantastic views. Deal was also recommended in The Times ‘Where to Cycle by the Sea’ feature. 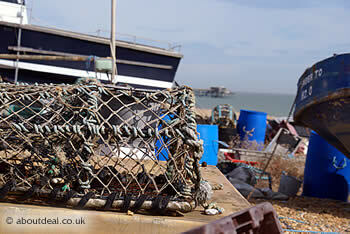 The 7 mile route from Deal to Ringwould was described as ‘short and sweet’ with ‘a bit of everything’. Other accolades include making it into the The Sunday Times’ Best Places to Live, The Times’ ‘top 30 places to live by the sea’ and being named as a top ‘hipster holiday’ destination for Londoners’ by the London Evening Standard. If you fancy a meal there are many pubs to suit all tastes from traditional to modern as well as restaurants offering English, French, Thai, Chinese and Indian cuisine. There is also a wide range of cafes and bistros plus plenty of sandwich bars and fast food take aways in the Deal, Kent, CT14 area. Deal also has a great range of specialty food shops including several great delicatessens and an Italian patisserie. Take a look at the many hotels, B&Bs and holiday cottages available in Deal.